FolderMill is a server-side application that watches defined hot folders and automatically converts incoming files or prints them on a specified printer. FolderMill provides an easy way to automate routine document processing tasks and establish a document flow in an enterprise environment. An administrator may define folders for monitoring and set actions to perform on incoming files. After this, it will be as simple for employees to print or convert documents as it is to copy files! 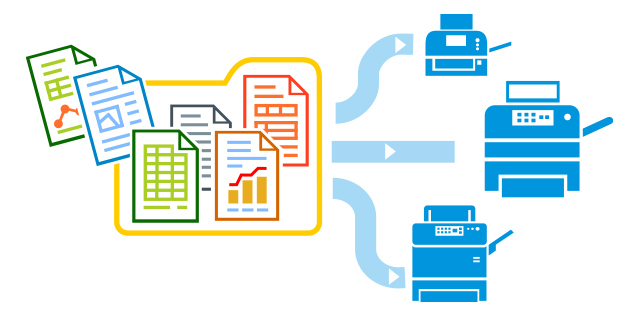 FolderMill automatically prints incoming documents on a defined printer. You can use any printer you want: local, network or even a virtual printer. FolderMill automatically converts incoming Word documents, PDF files, Excel spreadsheets, HTML files, images and other document types to PDF, JPEG or TIFF format. Get converted files in the Output folder or printouts from the printer. Tip: Share a Hot Folder within the office network and let your colleagues create desktop shortcuts to access them quickly. The user just needs to drop the incoming file into the hot folder to convert or print it. Basically there is no GUI needed for users to use FolderMill. FolderMill automatically prints incoming files on a specified printer. It’s possible to print the same document on several printers. Several processing actions for each hot folder are available, e.g., documents can be printed and converted to PDF at the same time! Keep original documents if needed, log the document processing flow and send alert emails if there are any issues with an incoming document. Document processing is very easy from the user perspective. The only thing required is to copy an original document into the input folder. Processing starts automatically, and a moment later the converted file will appear in the output folder or be printed on the selected printer. There is no additional software required to install on workstations. All processing is performed automatically on the server. FolderMill can process all common office documents including Word documents, Excel spreadsheets, PDF files, image files, HTML pages and many others. Thanks to its ease of use, FolderMill can be easily integrated into existing document processing flows. Based on a reliable engine and a highly professional and high-performance processing core, it’s possible to work 24 hours a day, 7 days a week, even in silent mode. FolderMill can process thousands of documents everyday. IT system integrators and independent software developers can include FolderMill into existing or new document workflows. It is possible to create as many actions as needed, and adjust them for different cases. Rasterize documents to JPEG, PNG or TIFF. You can also choose image quality and DPI. Send incoming documents to your desired printer. We've included FolderMill into our document workflow as incoming gate by adding straight forward processing rules and convert all documents to Tiff. Now we don't need to setup hardware, just put document to incoming folder and it will be printed on our Laser Printing Machine automatically. Download a free version of FolderMill to evaluate the software and use it for non-commercial needs. The free version allows you to try all of the program’s features. The only thing that differs from the commercial version is that a text "Created by FolderMill" - is attached to every output file. This license lets the user install, activate and run FolderMill under one Windows user account. The price for this license is $499. This license allows corporate users to install and run FolderMill in all company offices and on all servers. Volume discounts are available starting from 5 licenses. A special price is available for government and nonprofit organizations. Resellers and partners are welcome to join our worldwide distribution network! Please contact us to get more information. FolderMill 4.5: Process CAD Drawings and Filter Files by Contents- Automate printing & conversion of CAD files: Autodesk .DWG, .DXF, Solid Edge .DFT and Mathcad .XMCD, .MCDX drawings, filter files by text inside documents, and check new features for ZPL labels and text watermark! FolderMill 4.4: Merge, Split, Compress PDF in Batches- Merge & split PDF files, print crop marks, reduce PDF file size and use other features to automate file printing and conversion with new FolderMill 4.4! FolderMill 4.2: Split PDF files, Convert to XPS and Filter by Paper Size- Split PDF into single-page files, convert to XPS, prioritize processing of files in queue, filter files by page size - all that and more is possible with new FolderMill 4.2! FolderMill 4.1: New PDF Engine, Support for ZPL Files and Zebra Printers, Conversion of Files from ZIP and RAR Archives- Print or convert PDF and other office documents on server with FolderMill 4.1! New in this version: new file types supported, conversion of files contained within RAR/ZIP archives, printing of Zebra ZPL files, processing of password-protected PDFs, more options for Hot Folders and Actions and much more. fCoder provides robust digital document and image processing applications to corporations, educational institutions, government agencies and individual consumers worldwide. The company, which was founded in 1998, designs and develops software solutions within three divisions – document imaging, image processing, and digital photo editing. Please contact the customer support service if you have any question or suggestions. We’re always ready to help you use FolderMill to solve tasks effectively, deploy FolderMill in your company environment, integrate FolderMill into your system, and get volume, nonprofit or a distributor's discount.